These Are the People That Are Going to Win Back the House in 2018? “Activists,” it says here, “took a harsher tone. ‘It’s official: Chuck Schumer is the worst negotiator in Washington — even worse than Trump,’ said Murshed Zaheed, political director at Credo, a progressive advocacy group.” This is kind of cool to see the left all ticked off at their side for a change, don’t you think? (laughing) I knew it! I knew it had to be. The Republicans offered Schumer everything. In fact, given the radical nature of Schumer’s base… You know, we keep hearing about the Trump base, all these so-called populists and how they demand this and demand that and Trump can’t do the right thing because he would make his base mad. Let me tell you who’s a prisoner of his base, and that is Schumer. Something tells me that Schumer is not the radical that his base is, but that may not be true anymore. You know, I have to be honest. I’ve admitted to being naive on countless occasions on this program. I look at some of these Democrats, just look at them like one of them. One that comes to mind is Chris Van Hollen. He’s former member of the House in Maryland, now he’s a senator, and I look at these people… He’s just an example. I look at Joe Manchin. He’s on Fox right now. But take your pick. Sheldon Whitehouse, John Kennedy, all of these Democrats, the idea that they individually and personally are as radical as the people that vote for ’em is a tough thing for me to connect. I don’t doubt they’re liberals; don’t misunderstand. The kind of radicals I’m talking about are the radicals that hate this country, that are intent on whatever you want to call it — overthrowing or transforming or changing or what have you. These are people that genuinely do not like this country, primarily because they feel left out. They’re so odd and peculiar that they just feel left out of the mainstream in practically everything, and so they want to redefine what the mainstream is. And over the years, the way they’ve been educated and raised, they have just developed a poisonous hatred. You know, Schumer we have been chronicling his career, talking about him for 25 years is in the House. I know these guys are full-fledged Democrats, but to believe that they are as radical left as the Black Lives Matter group, for example, or as radical left as George Soros or as radical…? Now, they vote for it. So I guess it’s six of one, a half dozen of the other. But I do know this, I do know that they are prisoners to their base, and their base say lunatic fringe. The Democrat base is the lunatic fringe that has become the Democrat mainstream — and they are fed every day by the media. The media builds them up; the media promotes them. Mainstream left-wing radicalism is what’s being passed off now as moderate, mainstream Democrat. And they wanted Schumer to stick with this until Trump cried uncle. All they are about right now is getting rid of Trump. All they’re about right now is having Mueller come back and say that Trump and Putin spend the night together planning ways to overthrow America. They live in an absolutely irrational fantasy world that is designed and it’s informed by their continuing increasing hatred. Schumer, I think, had to do this shutdown just to placate these people. You know, they’re hell-bent on winning the House in 2018. They’re throwing everything they have into that. But what’s the agenda they’re running on? And this is not a good harbinger. If they’re gonna win the House in 2018 running against Trump, if they’re gonna try to parlay hatred of Trump as a national issue on which to win back leadership of the country… Hatred for Trump, anger, not having a positive agenda. If they’re gonna sit by and every piece of good economic news is gonna be criticized rather than joined? Not one of these in the Democrat Party voted for what is going to lead — and is leading — to this economic revival. Not one Democrat’s fingerprints are on it. But it’s worse that then. They have to run out and criticize it now, and they have to tell people it isn’t real. The Democrat Party has to go out and basically ruin people’s days. The Democrat Party has to go out and tell ’em, “This isn’t real. Your company doesn’t want to give you that bonus. They really are only doing it because Trump is making them do it.” They want to delegitimize everything good, and then they want to parlay that into victory? Well, if that was gonna work, this shutdown wouldn’t be over. If that was the way to beat Trump, if that’s the way to win back the House, this shutdown should just be getting going and it should be the Republicans panicking trying to end it. It should be the Republicans suing for piece. It should be Trump and the Republicans begging the Democratsto come back to the table. “What do you want? We’ll give it to you, but we gotta get the government going. We can’t be seen as the reason it’s shut down!” Well, they weren’t, thanks to Trump and thanks to Mick Mulvaney — and, yes, to Paul Ryan. This shutdown was owned by Schumer. Mulvaney got that process going last week at the White House at a press briefing calling it “the Schumer Shutdown,” and it stuck, because if it hadn’t, it wouldn’t be ending. And the left, the radical left knows it. Now, in the book story in San Francisco. This comes from World Net Daily. “California to Register Illegal Aliens to Vote Automatically — Court orders government to do so for all driver’s licenses issued. “California will take the next step … beginning April Fool’s Day when the state complies with a court order to begin automatically registering to vote all those who are granted driver’s licenses. The state has long provided driver’s licenses to all who simply claimed, without proof, that they were citizens… There were no checks made or documentation required. But beginning April 1” how appropriate, on April Fool’s Day, “every person who gets a California driver’s license will be automatically entitled to vote. ‘We are very pleased that Californians will have easier access to voter registration,’ said Jeremiah Levine, an attorney with Morrison Foerster who represented the voting-rights groups. ‘We are especially satisfied that changes will be made before California’s statewide and federal primary elections,'” and this on top of California’s insistence to remain a sanctuary state. “‘President Trump has expressed a desire to have border security with compassion on immigration. #WinningCombination. General Kelly is tough but reasonable. Some other staff in the White House hold extreme and unrealistic views. They hold us back from getting a solution,’ Graham tweeted. Shortly after his message on [Twitter], Graham was more specific… ‘As long as Stephen Miller is in charge of negotiating immigration, we are going nowhere. He’s been an outlier for years. There’s a deal to be had,’ Graham said. The White House fired back at Graham. “‘As long as Senator Graham chooses to support legislation that sides with people in this country illegally and unlawfully instead of our own American citizens, we are going nowhere…’ said White House spokesman Hogan Gidley.” So the Democrat Party and some Republicans went all-in on illegal aliens, call ’em DREAMer kids, DACA kids, what have you. The Democrat Party went all-in on people who are not citizens at the expense of people who are. And the question needs to be asked over and over again. Why do these people want less than the best to immigrate to this country? The old argument about a meritocracy is if we’re gonna have immigration, which we do, why not bring people in who are going to be assets, who want to be Americans, who are gonna help this country continue to be great and grow, rather than people who are gonna be a burden to the American people? Why would you want to do that? And the answer is very clear. The Democrat Party, for sustainability, needs a permanent bunch of people who cannot provide for themselves because they don’t know how. They don’t speak English, they don’t read or write, and they’re not gonna learn any time soon. But they’re gonna be registered to vote, see, like they’re doing in California. There’s a story. Stephen Dinan has a great piece today in the Washington Times. And, by the way, this was over a budget deal. This is what… The DACA, the DREAMer portion of this is part of the budget deal. It was a budget deal that shut down the government. The government shut down because it ran out of money. It didn’t shut down because of anything to do with DREAMers. But the media wants you to think it shut down because the Republicans would rather shut down the government than grant amnesty to DREAMers. That’s not what this was about, when you get right down to it. It was a budget deal, as all of these shutdowns are. But style, Dinan’s right, “It’s a stunning display of political leverage for a group that” are not even citizens (laughing) and “at most, numbers several million, can’t vote now…” So how in the world did they acquire this kind of “leverage,” and is it really they who have the leverage or is it their sponsors? Whoever! You know, the Democrats call you and me “deplorables.” They call illegals DREAMers. The “deplorables” are a problem, and the DREAMers are willing to shut down the government over it, as far as the Democrats are concerned. And this is how they think they’re gonna win back the House? This kind of agenda is how? They think the majority of Americans love the DREAMers, hate Trump, think America needs to let the illegals in and give them citizenship because America’s been so mean and rotten all these years? That’s what the Democrats’ belief is. “That’s why America needs to be transformed, because we’re mean-spirited! We’re rotten, we’re unfair, we’re bigoted and we’re biased and we are not nice. These are the people who are suffering because of the United States! “We have caused there to be war-torn poverty in their native countries. They have to come here. We owe it to them.” That’s Democrat view of the world, that the United States is the problem, “and we owe it to let these people in because we’re the ones who’ve made them illiterate and we’re the ones who made them poor and we’re the reason they can’t provide for themselves. We owe it to them to take care of them!” Where did they get that kind of power? Where did the DREAMers amass the kind of power that’s comparable to the Tea Party? And that’s how they’re gonna win in 2018? RUSH: Look at this headline from the Washington Times today: “DREAMers Reject Compromise to Reopen Government.” Who are we talking about here? DREAMers, the kids? These young, helpless kids that were brought here against their will or without their parents or however they got here? 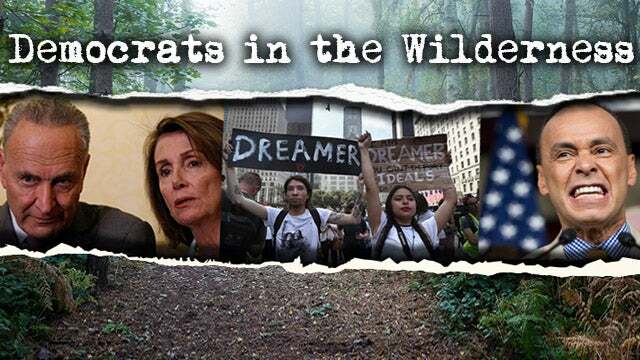 The DREAMers are demanding the Democrats reject this? You realize this shutdown didn’t last as long as the Martin Luther King three-day holiday? You realize how pathetic this shutdown was? I’ve got a tweet here from the… This is the deputy Washington bureau chief for the Boston Globe and a political analyst at CNN. His name is Matt Viser. It’s V-I-S-E-R. I never heard of him. Well, I’ve heard of him. I never heard his name pronounced. This guy is the deputy Washington bureau chief of the Boston Globe, political analyst at CNN. Ready for this? This is a journalist. “Democrats have managed to accede to Republican demands, demoralize their energized base, give a disengaged president a win and look like they held a meaningless three-day government shutdown all at once.” A journalist at the Boston Globe! He’s said; he’s disappointed. He’s not just chronicling events. He’s ma, he’s sad that the Republicans won and that the Democrats caved. What does that mean, “disengaged”? He could be headed for more of the same now. RUSH: Man, I just took a look at the White House press briefing, and these reporters look like they’re at a funeral. The more I see, the more I consume, the more I read, the more convinced I am that this thing totally blew up on the Democrats. This wasn’t supposed to end today. I’m telling you. This was supposed to go on, minimum, through the State of the Union speech. I mean there may have even been some Democrats thinking that that would have had to happen with the lights off since the government shut down. But seriously, they were hoping and planning on that. This was not supposed to happen. This didn’t even last, like I say, as long as the Martin Luther King three-day weekend. And now you’ve got journalists and radical leftists all over the place mad that Schumer bombed out. And I just want to remind you: The last time this happened, last February — coming up on a year ago — Chuck Schumer voted “yes” on some Trump cabinet nominees, and thousands of these unhinged, radical leftists held sit-ins and protests in front of his office in Manhattan and his New York apartment. They were chanting obscenities and protesting Schumer. A series of speakers stood on a platform and shouted over a mobile PA system, and they were jeering as they held signs with slogans like “Buck up, Chuck!” “Resisting Trump is your primary duty!” “Filibuster, filibuster, filibuster,” and they couldn’t even hold a filibuster for a couple days here. Three. These are the people…? I keep saying it. These are the people that are gonna win back the House in 2018? Can you imagine these people — the radical left base of the Democrat Party — so hates this country that their Democrat leaders are scared to death to even try to join in the good economic news? Everybody ought to be happy about this. The economy is reviving. Nothing better for the little guy could be happening than that. The economy is revitalizing. Raises, bonuses, new jobs, people keeping more of their money because of tax cuts. And the radical left base of the Democrat Party will not let their Democrats participate in it. This is new, folks. You know, I’ve asked the question, “What bound us together during World War II and in other eras when the country was threatened?” We all came together. What was the one thing we had in common? It was that we were Americans. It was like we were all cognizant of being on the team, and it was a championship team. It was a team that we were proud to be members of. But that’s gone. The radical Democrat base is not proud to be American. They’re ashamed, embarrassed or what have you. This country is ill-gotten, it’s ill-conceived, it’s wrong. And these Democrats, they’re not idiots. It’s not that long ago that James Carville said, “It’s the economy, stupid,” and we are going to have an economy this year like nobody has the guts to predict, and the Democrats are not gonna be able to participate. The Democrats are not gonna be able to go on TV and join in and celebrate. The Democrats, who’ve been telling the little guys for all of these years, “Stick with us, man! We are the way forward for you. We’re gonna get you increased wages. Your labor bosses are gonna triumph over management. We’re gonna do everything,” and here it all comes, and they’re not gonna be able to participate — and I’m gonna tell you something. Guys like Schumer and Joe Manchin and some of these other Democrat senators are gonna want like hell to be able to participate in this economic uptick and this revival. They’re gonna want to love to try to claim some credit for it, and they can’t. There are still some Democrats who are gonna be happy with American economic revival. Not all, but some are gonna be happy about it. It used to be everybody was happy about that, on balance. I mean, you always had some radicals that were kooks, but… What percentage of the Democrat base is not happy with it? What percentage of the Democrat base is threatened by a revived American economy with expanded opportunity, prosperity, all of that happening? RUSH: Tell me if this is not you. We think the Democrats are so smart. We think they are so crafty. We think they are always outmaneuvering us. We think that our side’s ready to cave. We think they have a strategy of the long game, that everything they do has a quantifiable, objective purpose, and that they always achieve it and that they constantly outsmart us right in front of our faces. When the truth is, in this instance, they threw it up against the wall hoping it would stick. They didn’t have any endgame! Their endgame was hope that hatred for Trump could generate support for what they were doing. They hoped that media would continue to carry their water and promulgate continued hatred for Trump. They thought Trump refusing to talk over the weekend would undoubtedly help ’cause they could portray Trump as somebody who didn’t even care what’s going, may not even know what’s going on. “He’s an idiot! He’s not all there! He’s out of his league!” How many of you think the Democrats are invincible in this kind of stuff? And I’m here to tell you, they benefit from a reputation that they don’t deserve. Look what happened the first time somebody seriously threw it right back in their laps. They didn’t know what to do. Somebody actually called it “the Schumer Shutdown,” and they seemed paralyzed. And the only question is, “How can you call it ‘the Schumer Shutdown’ when the Republicans control the House and the Senate and the White House? How can you…?” It’s all they had. Here’s a tweet from Brit Hume, and I think this probably exemplifies the Washington establishment. “I doubted it was possible, but the Democrats have actually lost a shutdown fight. “Schumer has agreed to end the filibuster in exchange for practically nothing. Make no mistake: Schumer and the Democrats caved. 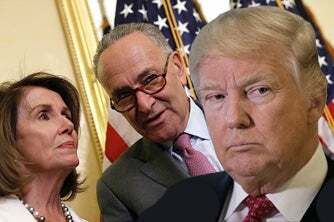 What a political fiasco.” Trump just refused to keep working with the Democrats. He said (summarized), “I’ve offered you — three different ways — everything you want. You say no. Fine. You own it. If it’s great, if this is what people want, you own it.” It proves this is not what people wanted. It proves that the Democrats are not in touch with the majority of Americans, nor is their base. I think in this case that they didn’t have an actual endgame strategy. What were they gonna get out of it? What was their objective? Was it actually amnesty for the DREAMers? I don’t think so, because they were offered that! Their objective was to humiliate Trump. Their objective was to have all of this blamed on Trump, like the media always helps them blame it on Republicans. But Trump didn’t even let the blame get anywhere close before he and Mulvaney aimed it right back at them. They ended up choking on their own accusation. I’m tell, folks, it is a big thing that the Democrats cannot now participate in any coming economic growth. They cannot! They didn’t vote for it. They voted against it. They are not worthy of you thinking they’re invincible and unbeatable. They’re not worthy of you thinking that they outsmart us and are two or three moves ahead of us in every issue. They aren’t. They can’t be. Folks, their minds are literally poisoned with hatred. There’s nothing uplifting or positive about hatred, especially hatred that does not fade. Theirs only intensifies. As every effort to destroy Trump and get rid of him fails, their hatred and that of their base continues to amplify, become more intense. It’s destroying them. It’s destroying their perspective. It’s destroying their public mood. They’re categorically incapable of even expressing happiness or joy or contentment, over anything in this environment. And I guarantee you, if something does come along that makes them happy and fills them with joy, it’s gonna be something detrimental to America, and that is not gonna help them. We’re not living in the days of Obama anymore — and maybe we never really were. But we’re certainly not now. UKDM: New California Law Will Automatically Register Illegal Immigrants to Vote... and it All Begins on April Fool's Day!